Gelled chia seeds will freeze up quite quickly when added to very cold smoothies and you will swear you are eating frozen dip and dots mixed in with your smoothie. Chia seeds do not have much of a taste on their own but they provide a magical frozen crunch along with wonderful magical health benefits. It’s true chia seeds look a little scary in smoothies at first, but their unique intrigue make up for it. This may not be for everyone but some of us absolutely love it! If you don't keep gelled chia seeds ready to go in the refrigerator to add to smoothies regularly, just before blending up your smoothie start pre-soaking the chia seeds. Pre-soak 2 Tbsp of chia seeds together with ½ cup of water in a small bowl or jar, stirring every few minutes in the beginning until the chia seeds are fully saturated with water and stop floating on the top. Chill in the refrigerator for 15-20 minutes or so. 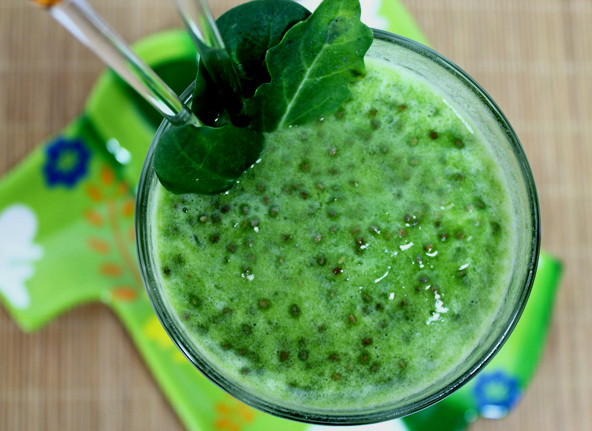 (Gelled chia seeds can last in the refrigerator for 3-4 days). They are now ready to be added to cold smoothies to do their magic. Chia seeds do not have to be pre-soaked before adding to smoothies for the nutritional benefits like flax seeds do. I sometimes blend them up along with all of the other ingredients or even put them in dry. You don’t notice them when blended well in a high powered blender and when they are added in dry, they have a crunch similar to strawberry seeds which is not bad. One time I blended dry chia seeds in my Orange Julicious recipe which is my daughters absolutely favorite smoothie. This isn’t a great idea because it turns a less appealing color when added to light colored smoothies. When I handed her the smoothie, she was obviously unimpressed but when she tasted it she exclaimed with surprise, “This is the best smoothie I’ve ever tasted!” So keep color in mind when adding chia seeds blended or pre-soaked. Unattractive color and presentation may keep some from even trying it.